Remember how Jan. 5 was unseasonably (and disconcertingly) warm? Thankfully, North Star Roller Derby’s Un/Lucky Season 13 kicked off with the first official double-header of the season to take your mind off global warming for a bit. While folks were out en masse wearing shorts and T-shirts like the decent Minnesotans they are, the athletes of NSRD were strapped up with kneepads and stuffed into compression pants back at the Lee & Rose Warner Coliseum on the State Fairgrounds. First whistle dropped at 6 p.m. and off went the Violent Femmes against the Kilmore Girls in the first bout on that weirdly muggy Saturday in January. Halfway through the first half, the Femmes had a confident lead of 32–10. The Kilmore’s deep pool of seven (seven!) 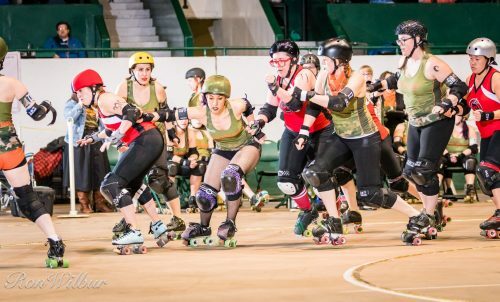 jammers made for a lot of fresh legs and styles of play, and they effectively shrank that gap to just four points as they rolled into halftime, sitting pretty with 49 points to the Femmes’ 53. The second half of the contest saw the Femmes dwindle to a pool of two jammers, The Fawkes and Amanita, as Jackillope said “Hasta la vista” after getting her fifth and final penalty. With fearless freshman skaters Sassberry, H-Bomb, and Lemony Kick-it putting up some gnarly pointage along fan-favorite vets, the KG’s put up a solid fight. In the end, they fell to the Femmes, 96–120, putting the Femmes at a promising 1 and 0 start for the season. 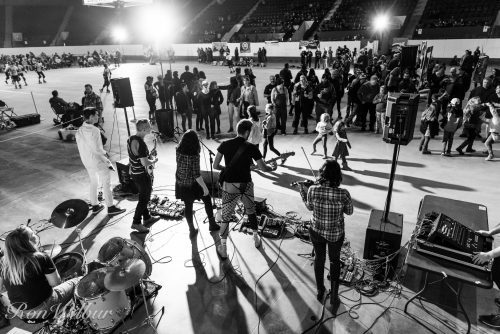 Fans rejoiced with hotdogs and brewskis while the halftime band, Fistful of Datas, melted all the faces in the crowd with 90’s and nerdy hits. All of this was in thorough preparation for the second bout of the night. Delta Delta Di rolled out in fresh uniforms featuring their latest logo, a unicorn (#yolo) to take on the Banger Sisters (who were, in case you’re wondering, still wearing their brass-knuckle emblazoned blue shirts of yore). 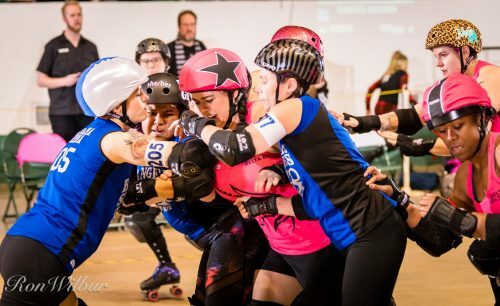 These are two historically tough teams, so pitting them against each other in the first bout of the season was pretty fun for all—except for those teams, maybe. It turns out that the Bangers’ first bout was going right along with the theme of the season. Luck didn’t smile upon them for a bit, and by the time they scored their first point in jam 6 of the contest, the Deltas had already put up a fat 40 pointeroos. Many jammers for the Bangers were pulling double-duty, stepping in as pivot when they weren’t busy running for their lives (aka, jamming). Deltas, on the other hand, whipped up a strategy of having their jammers pretty much just jam, and they were handsomely rewarded. Delta jammers Annaconda and Hitlist racked up a combined 75 points (an impressive 66% of their total points for the night) while they stationed some usual suspects like VALUED PARTICIPANT, LumberJill, Super Hutt, Killroy, and Guillotinea as blockers in their airtight walls. Bout 2 ended with the scoreboard showing 110 to 61, in favor of the pinks. It was a beautiful start to a beautiful season, despite being “unlucky.” The grub was fried, the beer was cold, the athletes were all-stars, and the ice caps are melting. But let’s ignore that Jan. 5 hit nearly 50 degrees, and, instead, let’s remember that day as one where we were all lucky enough to see another start to a sweet new season for North Star Roller Derby.